This view of the Nili Fossae region of Mars was compiled from separate images taken by the Compact Reconnaissance Imaging Spectrometer for Mars (CRISM) and the High-Resolution Imaging Science Experiment (HiRISE), two instruments on NASA's Mars Reconnaissance Orbiter. The images were taken at 0730 UTC (2:30 a.m. EDT) on Oct. 4, 2006, near 20.4 degrees north latitude, 78.5 degrees east longitude. CRISM's image was taken in 544 colors covering 0.36-3.92 micrometers, and shows features as small as 18 meters (60 feet) across. HiRISE's image was taken in three colors, but its much higher resolution shows features as small as 30 centimeters (1 foot) across. CRISM's sister instrument on the Mars Express spacecraft, OMEGA, discovered that some of the most ancient regions of Mars are rich in clay minerals, formed when water altered the planet's volcanic rocks. From the OMEGA data it was unclear whether the clays formed at the surface during Mars' earliest history or if they formed at depth and were later exposed by impact craters or erosion of the overlying rocks. Clays are an indicator of wet, benign environments possibly suitable for biological processes, making Nili Fossae and comparable regions important targets for both CRISM and HiRISE. In this visualization of the combined data from the two instruments, the CRISM data were used to calculate the strengths of spectral absorption bands due to minerals present in the scene. The two major minerals detected by the instrument are olivine, a mineral characteristic of primitive igneous rocks, and clay. Areas rich in olivine are shown in red and minerals rich in clay are shown in green. The derived colors were then overlain on the HiRISE image. 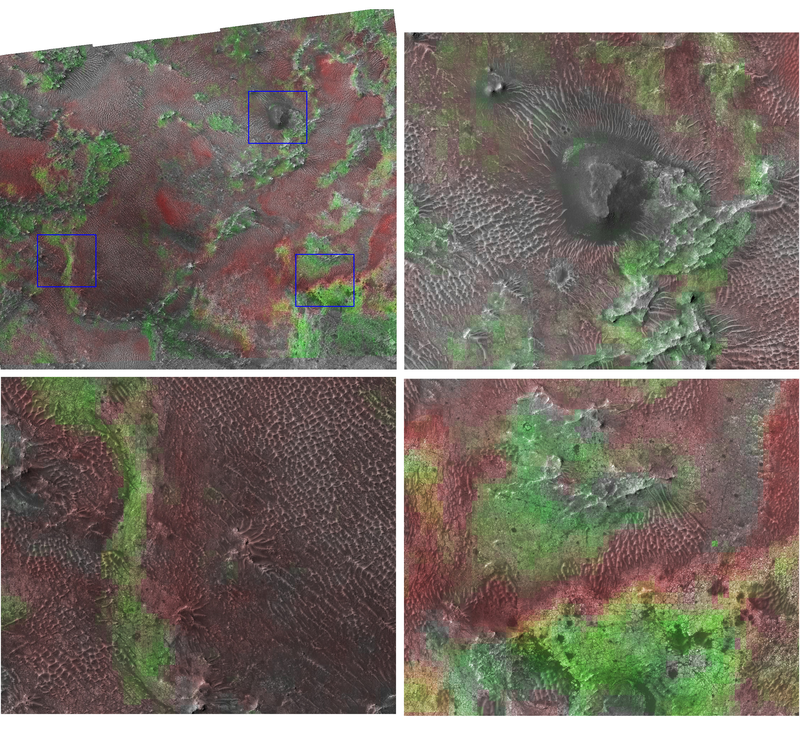 The area where the CRISM and HiRISE data overlap, shown at the upper left, is about 5 kilometers (3 miles) across. The three boxes outlined in blue are enlarged to show how the different minerals in the scene match up with different landforms. At upper right, the small mesa (a flat-topped hill) at the center of the image is a remnant of an overlying rock layer that was eroded away. The greenish clay areas at the base of the hill were exposed by erosion of the overlying rock. The images at the upper right and lower left both show that the reddish-toned olivine occurs as sand dunes on top of the greenish clay deposits. The image at the lower right shows details of the clay-rich rock, including that they are extensively fractured into small, polygonal blocks just a few meters in size. Taken together, the CRISM and HiRISE data show that the clay-rich rocks are the oldest at the site, that they are exposed where overlying rock has been eroded away, and that the olivine is not part of the clay-rich rock. Rather, it occurs in sand dunes blowing across the clay. Many more images of Nili Fossae and other clay-rich areas will be taken over the next two years, and used to try to understand the earliest climate of Mars that is recorded in the planet's rocks.